“With 19 Appalachian mining operations valued at $2.6 billion in 2008, parent company Massey had demonstrated a merciless coveting for coal at any expense. “In a haunting parallel to the Tennessee coal ash disaster, a Massey subsidiary in eastern Kentucky had been responsible for the largest coal slurry spill in 2000, leaking over 300 million gallons of toxic sludge into the area’s waterways and aquifers. Massey’s political connections in the Bush administration, however, resulted in a slap-on-the-wrist fine and the firing of one of the industry’s veteran whistle-blowers. Of particular concern in the Coal River Mountain case is its proximity to the large Brushy Fork coal slurry impoundment, which sits on top of underground mines. Should the impoundment give way, the protesters say, the resulting damage will exceed that of the 2008 coal ash spill at the TVA Kingston Fossil Plant in Harriman, Tennessee. Q. What are the goals of the protesters? Our goal is to shut down mountaintop removal in the Appalachians. Particularly, to stop them from blasting the top of the Coal River Mountain. Q. What is mountaintop removal and its environmental impact? Coal mining has been going here since the 18th century, but mountaintop removal is a relatively new form of coal mining made possible by the much larger equipment that they use today. They blast off the top of the mountain and dump it in the valley. They scrape off the coal, and then they try to plant a little grass. That’s all they do for reclamation. The real problem is associated with what they “coal waste,” which is actually the mountain itself, which goes into valley fills and all the coal waste that they produce—separating and cleaning and processing it—fills out all along the line. Most of that winds up behind a 370 foot damn which is up in the mountains. So this dam is made out of the same material as the stuff that’s holding back—it’s not an engineered dam. All the blasting and the water are bleaching through it. The major concern for this community is that that dam is not safe, and if it breaks, it won’t be like the TVA spill in Kingston. It will take out two or three small towns and a couple of schools. Plus, there is over twice the amount of toxic materials behind the dam. Q. How are the Kingston case and Coal River Mountain connected? Probably the most direct connection is the fact that the Tennessee plant, which is 50 years old, uses Appalachian coal from a mountaintop removal operation. That one is in Zeb Mountain in Tennessee. The ash there is very different from the kind of coal sledge that we have up here, but the way they store it is very similar. It’s not really impounded in an engineered dam but it’s basically just piled. These piles have a history of leaking and contaminating ground water all over the country where they have them, and they have a history of collapsing. That wasn’t the only one that collapsed, it was just the biggest one. Q. How long has Massey Energy Co. been operating in West Virginia? They’re relative newcomers in the coal business. About 10 or 15 years ago they came through and started to buy up the small mines and shut them down. This allowed them to get rid of the union workforce. They reincorporated the mines, reopened them with non-union miners and introduced the mountaintop removal process. They are not a very traditional operator here, and many of their employees are from out of state. They don’t actually employ nearly as many miners in this process as in the more traditional underground process. Q. Which groups do the protesters represent? 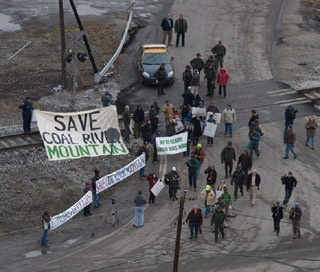 The group that I work with is called Mountain Justice, a coalition of many organizations including Coal River Mountain Watch, The Ohio Valley Environmental Coalition, Earth First! and Appalachian Voices. The organization I represent is called Climate Ground Zero, but I’ve been working here on this issue for about little over five years, when first Mountain Justice campaign was being planned. I’ve been living here since July, and we have been trying to do whatever we could to stave off the destruction of Coal River Mountain. Now, they’re proceeding the preparatory work to begin blasting. That’s kind of the thing we had hoped wouldn’t happen. Q. When is it going to happen? It is ongoing now. There’s been some road construction and some preparation. They haven’t started blasting yet, but they have all their permits. So far the governor has been mute on this. He has been very supportive of mountaintop removal in general, so we have been trying to figure out how we can pressure the governor to do the right thing. Q. Who can officially intervene here besides the governor? The president could step up. He has said that he is opposed to mountaintop removal. 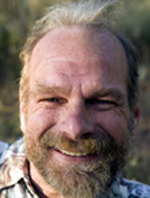 We know that James Hansen, the Nobel Prize winning NASA scientist, has contacted his office and has asked him to do something about the situation on Coal River Mountain. And Congress has a bill in front of it, a revision to the Clean Water Act, that would make it illegal for them to dump the waste into the streams, but we’ve been waiting for this kind of help for a long time. The mining has not only gone on, but their plans are opening new mines, including one on the Gauley River right by the New River Gorge, which is in the heart of West Virginia tourist and recreation area and one not traditionally open to this type of coal mining. Q. You’re proposing that wind power would be the better way to go. This site has been studied for wind power and found to be one of the best in the region. A proposal has been put forward with all the economic studies. There’s a great deal of community support for the Coal River Mountain wind project. It would produce more jobs, more tax income than the mine would, and it would be in perpetuity. This mine is scheduled to supply coal for 10 years—and that’s if there is much there as they think and often there isn’t. Q. Are you opposed to coal mining in general? Personally, I believe that we need to transition off fossil fuels, but we realize that it can’t be done overnight. Most of the scientists who study this issue and the serious policy makers who’ve looked at it, see the easiest way to achieve our greenhouse reduction targets is to shut down at least the antiquated, large coal plants like the Kingston fossil plant and to put the money into conservation and alternatives. I believe the era of coal is coming to a close. There’s just no clean way to burn it. The process creates toxic waste from the mine site to the power plant and then through the stack and the water outlets, it disperses pollutants to the rest of the environment. Oil and gas are not nearly as bad in this respect. So I think the reasonable thing to do is to cut our energy use by 50 percent and quit using electricity from coal. It is something that can be done quickly and the benefits would be great in terms of air and water quality, lower carbon emissions, visibility in our national parks, our fisheries, our soil. The list goes on and on. Q. What about “clean coal”? Q. What questions would you like reporters to be asking about this issue? My question would be: What gives these people the right to disregard every environmental law and regulation that we have to protect our air and water? We have already laws on the books that, if followed, would make mountain top removal illegal. We need enforcement of these laws. We need stricter interpretation of the regulations. We need monitoring. None of these ash piles are regulated. The household garbage that you put out on the porch is regulated more than the fly ash and the coal sludge that comes out of these coal burning facilities and the mines. Why do they get a pass when household garbage doesn’t get a pass? The Clean Water Act and The Clear Air Act were written for a reason and these particular industries were targeted, but with the influence that they have, with the money that goes into the political process, the politicians have refused to stand up to them. They have refused to enforce the law, at least the spirit of the law, and they’ve changed the letter of the law. The way the story is covered here is that we’re just one side of the argument, you know, that there might be a middle ground. Well, half a poison is not a good thing. There’s not a lot of middle ground out here and when you see what this is doing. Q. So what’s going to happen to the river if they continue? What will happen is, as the forests are removed, as the earth is compacted, the water is not going to soak into the ground table when the storms come. And because of climate change, we have more violent storms. This water is going to come rushing down in some kind of extreme weather event and just as they blamed the weather event in TVA, they will blame the weather on this. But already people are knowing that the water comes down more fiercely, the river gets higher and then it doesn’t stay up very long—the water runs on rather than sinks in. This leaves the river with less water during the summer. So the best thing to do is to figure out a way to truly restore the areas that they already destroyed, to try and create some way where this water can go back into the ground table. This is not going to be an easy thing, and the best thing to do is not to destroy any more mountains. Q. Would you like to add anything else? This community has decided that it is time for nonviolent civil disobedience, and they’ve stood up to the coal mining companies in the past. I think we’re getting ready to see a rebellion here because people just can not stand to see the last and the biggest mountain removed and the increased danger of this dam. Certainly, there are people here who support the coal industry, but I have been really surprised by the number of people I’ve talked to since we got arrested that are willing to voice their opposition to this blasting on Coal River Mountain. Q. What is happening with your citation? We’ve been cited for criminal trespassing, which has a maximum penalty of six months. We have yet to see judge and enter our plea, so we don’t know. In past cases, they’ve just handed out a fine, but we are determined that none of us will pay a fine. So they may have to put some of their local people here in jail, but we are intent on continuing our nonviolent resistance. This campaign has entered a new phase and that has mostly to do with the urgency of the situation with Coal River Mountain, the proposed mine on Gauley River and several other proposed expansions of existing mines. They’re planning on getting it all because there is no place in this part of the state that doesn’t have coal, and they’ve gotten about 50 percent of the surface area. If left unchecked, their plans are to depopulate this area and to turn it into a totally managed, flattened, depleted landscape, and they see the locals here as an impediment. And they won’t be stopped until either the law or the community itself stops them. Nonna Gorilovskaya is a researcher/writer for the Nieman Watchdog Project and a Ph.D. in politics student at the University of Edinburgh. I share your outrage. The Appalachian Mountains are beautiful, mysterious and forbidding -- a landscape where nature holds the upper hand, and that is how it should be. The effects of this abuse are far-ranging. Acid rain is damaging ecosystems everywhere on earth, especially in pristine regions like the Appalachian, Allegheny and Adirondack Mountains. We are squandering our great treasure for short-term gain. I am always glad to see attention given to this problem. Thank you.